Masahiro Tanaka will likely miss at least one start. We don’t yet know the severity of his hamstring injury. 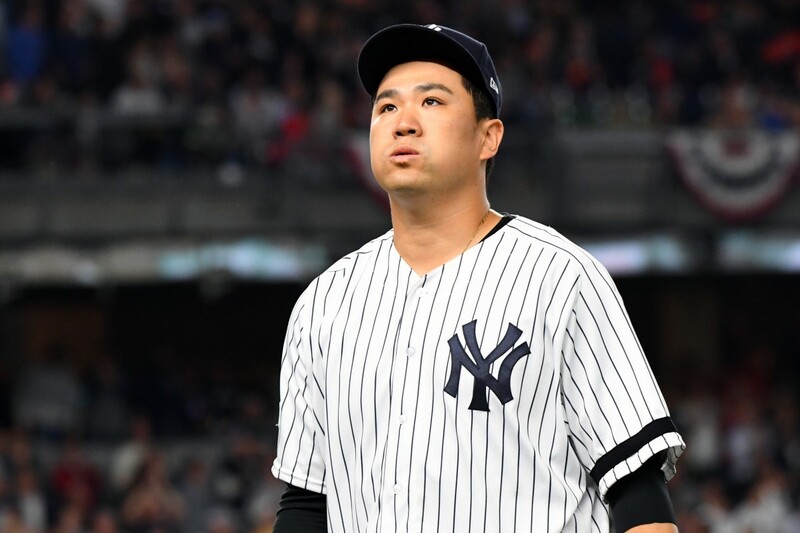 If he only misses one start, the Yankees may be able to use the Monday off day to skip Tanaka and avoid having to call someone up. However, after that, they play 17 games in 16 days. The Yankees probably need to find a starter. Who will fill in? The Case For: Justus Sheffield is the top Yankee pitching prospect, by a lot. He’s got all the stuff, and some of the performance: 55 1/3 innings between Double-A and Triple-A, 2.60 ERA, well more than a strike per inning. He pitched on Friday, so he’s perfectly lined up with Tanaka. He’s going to make the major sooner or later in 2018, so it might as well be sooner. The Case Against: Justus Sheffield is not on the 40-man roster. If Tanaka’s major league absence is short, it probably doesn’t make sense to add Sheffield, and thus DFA someone else. His Triple-A performance is also arguably imperfect. While the run prevention and strikeouts have been there, Sheffield has also had serious control issues, with 29 walks over his 55 1/3 innings. I’m skeptical that he can survive in the majors with such an extreme walk rate, and the walks are likely to get worse, not better, after promotion. The Case For: A.J. Cole is on the roster, although you’d hardly ever know it if you watch Yankee games. Cole is not stretched out, but he could probably go out and throw 60 pitches without the world ending. The rest of the bullpen would take over the game after that. Cole is essentially a replacement level starting pitcher, playing in a replacement role. If Tanaka doesn’t require a DL stint, he would allow them to cover his game without a roster move. The Case Against: A.J. Cole is not good. In fact, he’s pretty bad, which is why the Yankees were able to acquire him for nothing earlier this season. His career ERA is 4.91, with a worse FIP. Cole has been solid in short outings for the Yankees since his acquisition, but the infrequency of his usage by Aaron Boone speaks volumes about the Yankees’ opinion of Cole. He’s fine as a bullpen game starter but unacceptable as a longer-term option. The Case For: I made the case for Josh Rogers in a post a few weeks ago. The short version: he’s basically Jordan Montgomery a few years ago, with slightly fewer strikeouts. He’s probably been the best Yankee starter a Triple-A. He goes deep into games. The Case Against: Rogers got bombed the last time he pitched, on June 3rd. He gave up six runs in one inning. However, he was coming off a string of successful starts, pitching 27 1/3 innings in four starts with an ERA under 2, so take the bad game with a grain of salt. The more significant problem is talent. Josh Rogers may just not be all that good. The Case For: Like pretty much every other Yankee fan, I first learned about Loaisiga when he was added to the 40-man roster before the Rule V draft last Fall. He spent most of that time pitching in rookie ball as a 22-year-old, so there was little reason to know who he was. In fact, it was curious that the Yankees would use a precious 40-man roster spot on a rookie ball pitcher while someone like Caleb Smith didn’t make the cut. It turns out that the Yankees knew what they were doing. Loaisiga is now in Double-A, and has been nothing short of a sensation: 54 strikeouts and just 4 (!) walks in 43 innings with a 2.30 ERA. And, of course, he’s already on the 40-man roster. The Case Against: Moving up from rookie ball to the majors in less than one calendar year is pretty much unheard of for good reason. Loaisiga probably isn’t ready yet. The Yankees have been very protective with his arm; he hasn’t yet pitched more than five innings and is likely on a very strict pitch count. The Yankees likely have a plan for his development, and a sudden call-up would interrupt said plan.